At the International Tiger Forum, Governments of 13 countries that host tiger populations agreed to double tiger numbers by 2022 and endorsed the St. Petersburg Declaration in a historic effort to save the Asian big cat from extinction. Actions will focus on protecting the tiger’s habitat, addressing poaching, illegal trade and providing the financial resources for this emergency plan. Over the last century, tiger numbers have plummeted from about 100,000 to less than 3,500 tigers in the wild today. Three sub-species of tigers have already completely disappeared and the fate of the other six is at stake. The last decade alone has seen a decline of almost 40 per cent in tiger numbers and habitat as a result of human-made threats, such as, in particular, habitat loss, illegal wildlife trade and poaching and human-tiger conflicts. In order to stop its devastating decline, the 13 countries have agreed to strengthen international collaboration to protect the majestic Asian wild cat. Scientific monitoring will be improved to help restore the species’ habitats and its trans-boundary corridors. Halting poaching and illegal trade of tigers and tiger products is a core component of the conservation strategy. 17-09-2010: The St. Petersburg Tiger Summit later this year on November 21 st is expected to build on new momentum established by several international events on tiger conservation in 2010, the International Year of the Tiger. The Global Tiger Summit in St Petersburg will bring together the 13 countries that still have wild tigers, along with conservation organisations, in an attempt to thrash out a global recovery plan. Britain and the US are also being urged to attend. 15-02-2010: Het aantal wilde tijgers in Azië moet de komende twaalf jaar verdubbelen, zodat er in 2022, het volgende Year of the Tiger, een echt tijger-feest kan plaatsvinden. De wereldwijde tijgerpopulatie zit nu, beetje afhankelijk van de schattingen, op 3000 tot 5000 dieren. In 2022 moeten dat er minimaal 7000 zijn. De tijger staat op de rode lijst van bedreigde dieren. 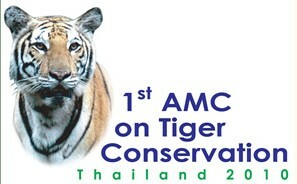 Dat zijn de vertegenwoordigers van Bangladesh, Bhutan, Birma, China, India, Indonesië, Cambodja, Laos, Maleisië, Nepal, Rusland, Thailand en Vietnam overeengekomen op de 1st AMC on Tiger Conservation Conference in HuaHin Thailand. Op een een volgende Tijger-Top in het Rusland zullen concrete maatregelen worden genomen om dit doel te bereiken. It is the Chinese Year of the Tiger and also the International Year of Biodiversity. So it seems more than fitting that this year will also see the first Tiger Summit, scheduled for this coming November, to be hosted by Russia’s Vladimir Putin, prime minister of the summit’s host nation. The summit marks the culmination of efforts by the Global Tiger Initiative GTI), begun in 2008, to address and mitigate the severe declines in tiger populations world wide. Leaders of 13 tiger range states and their supporting donors, NGOs and conservation groups will be asked to commit to substantive measures to prevent the extinction of the world’s last, wild tiger populations. Hollywood actor Leonardo DiCaprio will put his fame to work to raise global awareness about India’s dwindling number of tigers, an official said Saturday. DiCaprio and India’s Environment Minister Jairam Ramesh met at a reception Friday in New York organised by the Coalition of Rainforest Nations, an inter-governmental organisation. India’s endangered tiger population has plummeted to 1,350 — just over a third of the 3,700 estimated to be alive in 2002. Earlier this year, Bollywood actor Amitabh Bachchan joined a campaign to protect the tiger. A report released today reveals how Htay Myint, one of Burma’s most powerful tycoons, is establishing massive mono-crop plantations in the world’s largest Tiger Reserve in northern Burma’s remote Hugawng Valley. Htay Myint’s Yuzana Company, a Burmese conglomerate with close ties to the ruling military, was granted 200,000 acres in the Hugawng Valley Tiger Reserve in 2006 to establish sugar cane and tapioca plantations. The report Tyrants, Tycoons and Tigers by the Kachin Development Networking Group (KDNG) details how fleets of bulldozers and backhoes have been razing forests and destroying animal corridors, leaving only the conservation signboards standing. The Reserve was established in 2001 with the support of the US-based Wildlife Conservation Society (WCS). However WCS has remained silent on this destruction of the Reserve and has even claimed that Hugawng Valley will be a cornerstone of tiger conservation in the future. “The destruction in Hugawng makes a mockery of the tiger reserve,” said KDNG spokesperson Ah Nan. “Yuzana is doing whatever it likes with the aid of the generals and the silence of conservationists.” Despite the plantations, Burma’s military regime claims in its recent National Tiger Plan that it will double the country’s tiger population by 2022. The plan will be submitted at the Global Tiger Summit in later this year. The new report also documents the struggles of indigenous farmers being forcibly relocated to make way for the plantations. They have organized themselves to resist attacks and intimidation from Yuzana and regime officials, opened a court case against the company and asked the International Labor Organization to intervene. The tiger is the largest of all cat species. It is also one of the most threatened. There are six living subspecies of tiger: Bengal, Indochinese, Malayan, Amur (or Siberian), Sumatran and South China. The South China tiger is believed by many scientists to be functionally extinct because it has not been seen in the wild for more than 25 years. Wild tigers could become extinct in 12 years if countries where they still roam fail to take quick action to protect their habitats and step up the fight against poaching, global wildlife experts told a “tiger summit” Sunday. The World Wildlife Fund and other experts say only about 3,200 tigers remain in the wild, a dramatic plunge from an estimated 100,000 a century ago. James Leape, director general of the World Wildlife Fund, told the meeting in St. Petersburg that if the proper protective measures aren’t taken, tigers may disappear by 2022, the next Chinese calendar year of the tiger. Their habitat is being destroyed by forest cutting and construction, and they are a valuable trophy for poachers who want their skins and body parts prized in Chinese traditional medicine. While the majority of the discussions at the International Tiger Forum in Saint Petersburg this week are understandably on the tiger’s habitats and ecosystems, the heads of five major international agencies have met to seal a powerful alliance to fight wildlife crime effectively and discuss collective actions to stop the key drivers that are bringing the largest of the wild cats to the brink of extinction: poaching, smuggling and illegal trade. The Secretary-General of the Convention on International Trade in Endangered Species of Wild Fauna and Flora (CITES), the Secretary-General of ICPO-INTERPOL, the Executive Director of the United Nations Office on Drugs and Crime (UNODC), the President of the World Bank and the Secretary-General of the World Customs Organization (WCO) have signed a Letter of Understanding that brings into effect today the International Consortium on Combating Wildlife Crime (ICCWC). “Poaching and illegal trade have brought wild tigers close to the point of no return. Only if we work together, can we ensure that tigers will survive. Our children should inherit the privilege of looking at tigers in the wild and not only behind bars in a zoo. Instead, it is those criminals who poach and smuggle tigers that should be the ones behind bars,” he added. Bollywood veteran Amitabh Bachchan has decided to sell some of his personal belongings to raise funds for conservation of tiger, the numbers of which have dwindled in recent years. “Shall be auctioning some of my personal belongings to generate funds for this noble cause – Save the Tigers!,” tweeted Bachchan. India’s latest tiger census shows an increase in the numbers of the endangered big cat, but threats to their roaming territory could reverse those gains. India has released the figures of its latest tiger census, and it shows an increase in their numbers in the wild. The result comes as The International Tiger Conservation Conference is being held in New Delhi. Tigers are present in 13 countries across Asia as well as Russia’s Far East Back in the year 1900, 100,000 tigers existed in the wild. Today there are as few as 3,200 remaining, according to the World Wildlife Fund. India is home to more than half of the world’s wild tigers. They’ve counted more than 1,700 – that’s almost 300 more than four years ago. That’s a rise of 15 per cent. Some of the world’s leading tiger conservationists, scientists & experts have just gathered in Bangkok for Panthera’s 6th Annual Tigers Forever meeting to discuss the most recent findings on the state of the remaining 3,200 wild tigers & the next steps required to ensure the long term survival of the species.